The Kris Extra Tall Stool stands at an unusually tall 34’’ height. These types of chairs are ideal for use as spectator chairs in a game room, or may be used to fit your extra tall custom tabletop. 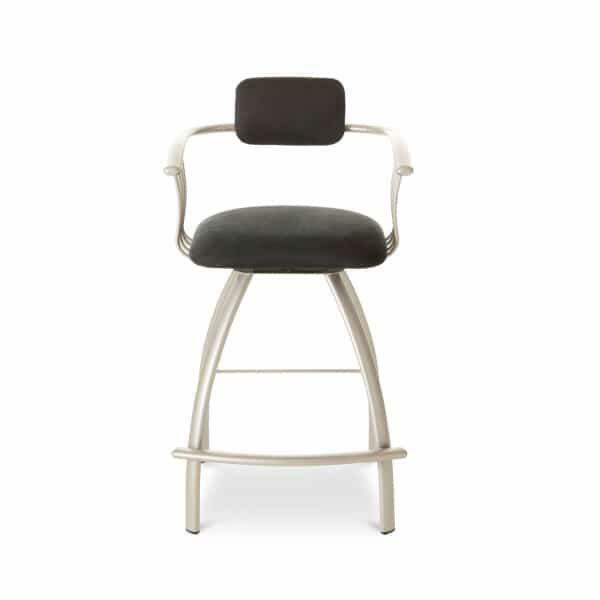 The Kris Extra Tall Bar Stool comes in the same form as the other versions of the Kris stools. The Kris stools feature a steel frame that is protected with a baked powder finish. The finish protects the steel frame from scratches and nicks. The seat is cushioned with a plush cushion and covered in fabric. You get to customize both the frame and the cushion to meet the style needs of your space. Choose from a range of frame colors, like the featured metallic finish and more subtle tones, and pick a fabric from a selection that includes the featured solid black and busier, lighthearted designs. Amisco aims to give you enough options so that every stool you own is tailor-made to suit you and only you!